DISCUSSION – NLC representatives discussed Neighborhood involvement with Mayor Vinis on neighborhood involvement in the process of creating land use policy. Discussion was facilitated by Thomasina Bates. DISCUSSION – Follow up on the discussion with Mayor Vinis. DISCUSSION – Jon Belcher introduced the topic of Clear and Objective Standards relating to land use. Jon proposed a subgroup of Land Use Committee be formally formed. Eben Fodor – Middle Housing? Neighborhoods Represented: Southeast Neighbors, Downtown Neighbors Association, Friendly Area Neighbors, Goodpasture Island Neighbors, Jefferson West side Neighbors, Laurel Hill Valley Citizens, River Road Community Org, South University Neighborhood Assoc, West University Neighbors, and the Whiteaker Community Council. NLC members were joined by Shanalea Forrest from the Community Alliance of Lane County (CALC) and HRNI program manager, Jen Lleras Van Der Haeghen. The Southeast Neighbors board has been divided about pursuing the appeal and in its approach to welcoming Amazon Corners to our community. Incidents have dramatically increased. Reporting is essential. HRNI has created binders for Latino and Immigrant families to understand how to prepare themselves if they are contacted by the authorities. Emergency go kit. Because of concerns about policing and safety in the community, we decided to invite Pete Kerns to the next NLC meeting. Rene will reach out to invite him. Heather will send out a call for feedback to capture questions and concerns from the neighborhoods to give to him in advance. A variety of EugFun! neighborhood park events, concerts, movie nights is happening this season. Printed EugFun! season “passport” and online schedule ready in May. See http://www.EugFun.org. Recruiting volunteer teams for summer Olympic Trials. Free first aid/CPR training offered in April. Open to high school juniors/seniors and adults. Also Red Cross continues their Home Fire Preparedness Campaign, with free smoke alarms. Consider them for community info tables at our neighborhood events. 8. Next meeting agenda – City Parks & Open Spaces staff will talk about notification for pesticide spraying, pesticide free parks program, etc. Next quarterly Neighborhood Chat will be earlier the same evening. 2. Public comment– Anand Holtham-Keathely. Festival of Eugene: Call for volunteers and involvement. 5. Communications Update– Heather Sielicki , No current chair for committee. Started an NLC website on wordpress. Continuing to search for cheaper printing. Rene will circulate suggested common headings for our NA pages on the HRNI website. 7. NLC Planning– Neighborhood chat topics and scheduling. Weekend trainings for team building suggested as well as scheduling chats separate from NLC meeting. Next neighborhood chat is scheduled for April, discussion may focus on city sponsored summer events. When the NLC Co-Chairs have determined that an electronic motion for action by the NLC has been properly made and seconded, and they have determined that a vote on the motion cannot wait until the next regular meeting of the NLC, they shall appoint one Co-Chair to conduct an electronic vote using the following procedure. 1. The Co-Chair shall set a deadline by which NLC members must cast their vote, and send an email with that deadline and the exact wording of the motion to all representatives on the official NLC email list. The Co-Chair shall communicate the same information to those NLC members whose e-mail address is unknown or otherwise unavailable by email, either in person, by telephone, by text message or by other reliable means. The time allowed for voting shall be no less than two days and no more than five days. 2. While online discussion for clarification of the motion is allowed, an electronic motion cannot be amended. The maker of the motion can withdraw their motion, with or without the permission of the second, at any time before the close of voting. In this event, any NLC member may submit an alternative motion, and if seconded, the voting process begins afresh for the new motion. Only one motion on any subject can be considered at any given time. In the case of uncertainty about whether two motions cover the same subject, the NLC Co-Chairs shall make a determination, which cannot be challenged until the next regular NLC meeting. 3. Each neighborhood has one vote. That vote must be cast by the duly appointed or elected NLC representative for the neighborhood, or their designated alternate. The vote is cast by a direct and unambiguous communication to the NLC Co-Chair conducting the vote, either in person, by email, by telephone, by text message, or by other reliable means, and must be available to the Co-Chair by the close of voting. 4. At the close of voting, the NLC Co-Chair conducting the vote shall communicate the result to the NLC email list, as well as by other means to those members not on the NLC email list. The emailed result message shall list each neighborhood that voted and their vote, and list those neighborhoods that were eligible to vote but abstained. The NLC Bylaws (as amended) state that the motion is adopted if it is approved by a simple majority of current NLC voting members, in other words, YES votes must exceed the sum of NO votes and abstentions. 5. The NLC Co-Chair conducting the vote shall report the motion text and the voting result at the next regular NLC meeting and include them in the minutes of that meeting. Discussion – You can change your vote within the voting window. A motion could be made on a new, emerging topic, and the co-chairs would determine if it warrants electronic action. The quorum needed is slightly higher than that needed at a meeting. We expect this procedure to be rarely used, and most likely during the city budget process. 5. Nomination Committee – the committee nominates Wayne Wilson as next co-chair. Election at February meeting. • The idea to use an ENI nonprofit bulk mail permit has hit a dead end on several angles. So this idea is no longer on the table. • Best bet is for NAs to pursue their own 501c3 tax exempt status for long term savings. Assumption is that we would continue to receive any city funding and have ad-free publications. Otherwise, if we go with all-advertising-funding, then we can’t take advantage of a nonprofit rate. • There is the option to combine the news of several NAs in order to get a larger print run and cheaper cost per piece. This option would take a lot more coordination with partnering NAs. A trial run with a few existing/adjacent NA newsletters might be worth exploring. • Selling ads is a viable option, but would take time/skills. The ban on advertising has been lifted by city council. The city (and HRNI funding/reimbursements) will be charting new territory with NAs as we pursue ad revenue and blending city funds with private funds to pay for things. 7. Next meeting agenda –staff from City’s Community Events to discuss 2016 schedule and opportunities for neighborhood involvement. Mike and Ken presented an overview of current local services for people experiencing homelessness. Legal camping options, in-car camping program, rest stops, new dawn to dusk pilot program, safe parking program, Egan Warming Center. We saw a new map that shows the current distribution of these services around the city. Mike and Rene are circulating to any interested NA boards to get us thinking about locations within our ‘hoods that might accommodate more such services. There is a push to distribute these services more evenly across the city. 4. Nomination Committee – the committee to find a nominee for next co-chair will be Deb Jones, Alberta Cook, Heather Sielicki. Discussion: Our last budget lobbying effort got us reinstatement of outreach and matching grant funds for one year only. We need a permanent fix, rather than annual lobbying effort. Can we provide our case early enough to Budget Committee to avoid the scenario that city manager proposes a cut? Ask HRNI to modify their annual report form for NAs to collect more of the information that is helpful to making our case. When will we have tangible progress to report on communication cost savings? See Communications Committee update on nonprofit bulk mailing. Also, HRNI is forming a support plan/committee to help struggling NAs revive/get active again with whatever tailored form of help is appropriate. Rene has not much response from NA board members to help with this project and will promote it again. This year’s NLC Budget Committee members – Jon Belcher, Pete Knox, Randy Prince. We also will ask others who helped last year (Stephen Heider, Juan Carlos Valle, Josh Newman, John Barofsky). FY17 Budget Committee timeline has already started – see http://www.eugene-or.gov/list.aspx?ListID=353 to sign up for budget committee updates. 6. Communications Committee – we need to reconvene this group, esp to organize/show our progress to the city Budget Committee. We are investigating whether Eugene Neighbors Inc (ENI) can provide a nonprofit bulk mailing permit for individual NAs to use. This would save a large amount of money. 7. Next meeting agenda – final procedures for e-voting. 9 neighborhood associations nominated people for these seats. 10 NAs voted. MUPTE is not a concern in some neighborhoods. Most nominees were not known by most NAs. Short candidate statements did not provide enough information, esp to rank all 13 nominees. Not all NA boards could discuss the process by email and/or under short time frame. Maybe some votes did not count because voter did not rank all 13 names. Time frame for the whole process should be longer. Look for alternate online voting tools that do not require ranking of all candidates. Considering the Oct 2014 motion of NLC (“NLC believes that the two neighborhood standing reps should be selected by the NLC not by the Mayor”) – it’s not clear that the NLC process had any impact on generating nominees. We can invite the two at-large reps to future NLC meetings. NLC to discuss how to re-establish some clout with this city manager. In the past, city managers have relied on the NLC for appointing people to city advisory committees. SDCs have to be used for the purpose they were collected (e.g. transportation, storm water, etc.) Cannot mix and match funds between these groups. There may not be any SDCs collected on projects which are exempt such as affordable housing projects. MUPTE does not waive SDCs. Neighborhood impacts that extend beyond the neighborhood that contain the project are not necessarily covered. It was unclear how and when the CIP (Capital Improvement Plan) can be amended now and whether the process can be modified by the Council. The CIP is a 6-year plan that is generally updated every 2 years. Mark suggested that the annual budget approval and the two subsequent updates might be times to add projects to the CIP. However, it was noted that one cannot anticipate development and predict their impacts on the neighborhood. Original NLC intent was mostly aimed at transportation needs. Transportation SDCs must be used on arterials or collectors, but lots of new development is happening on local streets. This targeted usage policy was determined by the Eugene City Council and is not a State requirement. The reality of spending SDCs in accordance with state and local policies is more complicated than our original NLC motion anticipated. Clarity is needed to determine whether and how SDC assessments are made and credited to the developer and what process/es need to be in place for them to be allocated to mitigate local impacts as envisioned by the motion. We also need to understand how the PEPI (Privately Engineered Public Improvements) process impacts as well. 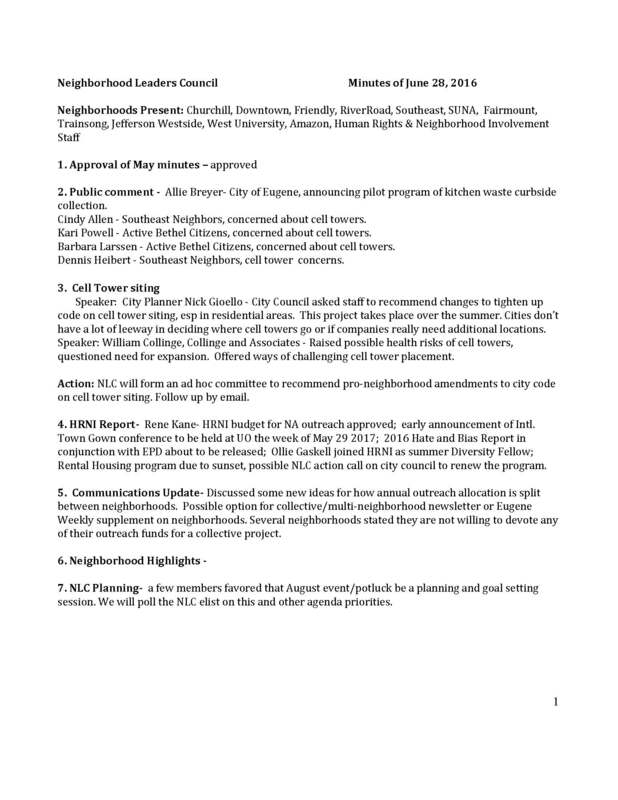 Proposal is to hold chats quarterly, alternate between structured and unstructured, schedule for a different night than NLC business meeting, find a different venue than Atrium (where people can buy food), or rotate to different neighborhoods.